Nice review of an article in the Journal of General Internal Medicine at the Incidental Economist. The article documents delays in care by people with chronic illness and high deductible coverage. that people aren’t very good at discriminating between necessary and unnecessary care. This is fine if you’re healthy, when pretty much all care is unnecessary. If you’re sick, though, then across the board care cuts can be bad. 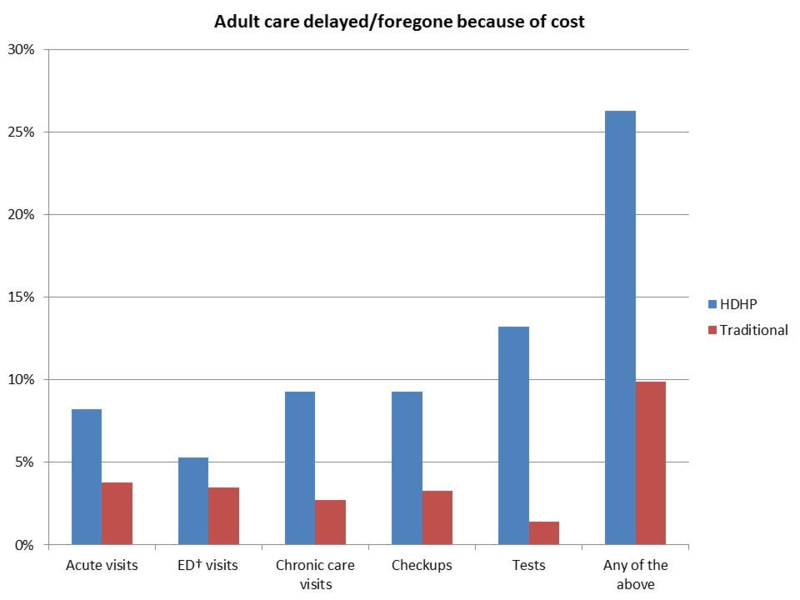 More than a quarter of adults had delayed or went without care because of cost. Adults were specifically more likely to delay or forego acute care visits, chronic care visits, checkups, and tests. There were similar findings for care in children whose families had this type coverage. The delays were particularly noted in those below 400% of the poverty line. Medicynical Note: I’ve previously expressed reservations regarding high deductible insurance and Health Savings Accounts. For those at or below the median wage, high out of pocket expenses influence whether or not to seek care—a form of implicit financial rationing. In this setting the least knowledgeable, most emotionally involved get to decide whether or not to go for expensive interventions for which they will have to pay. This might work if our costs were affordable, but they’re not.